Falafel Yo is the newest Mediterranean restaurant to hit the local scene. 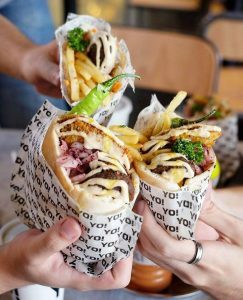 Founded in July 2017, it is the second food venture of Israeli nationals Yuval, Nofar, and Guy Mann. The men, who have called Manila their home for seven years, also own Chaplin Café, a casual dining and watering hole in Century City Mall, Makati. Falafel is a deep-fried fritter made from chickpeas and spices. It is 100% vegan. It is a street-side snack popular in Mediterranean countries like Greece, Turkey, and Israel. There is more to the golden brown nugget than meets the eye. The Falafel (The Original) includes six falafels sandwiched between pieces of Pita bread, with a variety of side salads and sauces to complement the meal. For a heartier variant, the restaurant offers the Falafel Beast. It’s the same falafel sandwich with strips of hearty beef mixed in. Falafel Yo also offers the Lemongrass Smoothie, a refreshing and healthy thirst quencher to wash it all down. Sides include fried eggplant, homemade hummus (a Mediterranean dip made from chickpeas and tahini), pickled onions, roasted green chilies, coleslaw, lettuce, and French fries. Choose from a variety of homemade sauces like amba, a yellow sauce made of mango, cumin, and turmeric, or tahini, made from sesame seeds, coriander, and parsley. 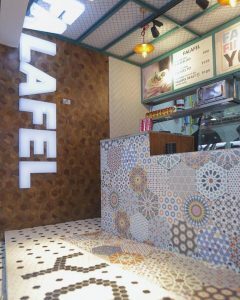 Falafel Yo opened its first location at the Level 4 of Greenbelt 3, Makati. It recently opened its second branch in Level 4, Vertis North, Quezon City. Call 8231302 (Makati) or 9465335 (Q.C. ), e-mail [email protected], or visit http://falafelyo.com/ for questions or more information.